I write about all aspects of traveling with a small dog (our dog, Chloe, is a young Cavalier King Charles Spaniel), but most of the questions I get are about taking a small dog on a plane. And most of those questions are about choosing a carrier. It’s a bewildering task: There are lots of choices, and there are lots of parameters to worry about. Nearly all of the U.S. airlines allow small dogs to travel in-cabin, and many international airlines do too, but there is no standard accepted maximum carrier size. Take a look at the “Guides” section on my blog, Dog Jaunt, and you’ll see that the maximums range from extremely small (Sun Country’s 8Hx16Lx11W) to the relatively palatial (THAI Air’s 12Hv22Lx15W). What’s a dog owner to do? The very first thing you need to do is measure your dog’s height. The crucial measurement is the distance from the floor to the top of your dog’s shoulders — not his head, his shoulders. Imagine that your dog has put his head down to drink water. His head and neck have bent low; the remaining body height is what you care about. That’s because your dog will spend nearly all of his time in his carrier lying down, either curled up or stretched out. He needs to be able to turn around freely in his carrier (that’s merciful, and it’s also an airline requirement), but he doesn’t need to raise his head completely to turn around or be comfortable. That number is the minimum height that your carrier needs to be. If you’re blessed with a mini Dachshund, for example, you’ll likely be able to purchase a carrier with extra vertical room. We, however, have a dog that is 12″ tall, and so is her carrier. Another crucial measurement is your dog’s weight. In general, a dog that weighs more than 15 lbs. is going to be too large to travel in-cabin. Some airlines have maximum weight requirements (look out, especially, for some very low international maximums), but the main problem is that a dog larger than 15 lbs. may not fit in a workable carrier and still be able to turn around freely. Chloe weighs 13 lbs., and she is at the upper limit of what works. If you plan to take only one plane trip with your dog (say, for example, you hate to travel, but you need to relocate from Houston to Seattle — please note that I’m choosing two cities not serviced by the pet airline Pet Airways, which will carry your dog in-cabin for you), ignore this advice. Buy an inexpensive but complying carrier, like the small Bergan Comfort Carrier (available on Amazon), and call it good. 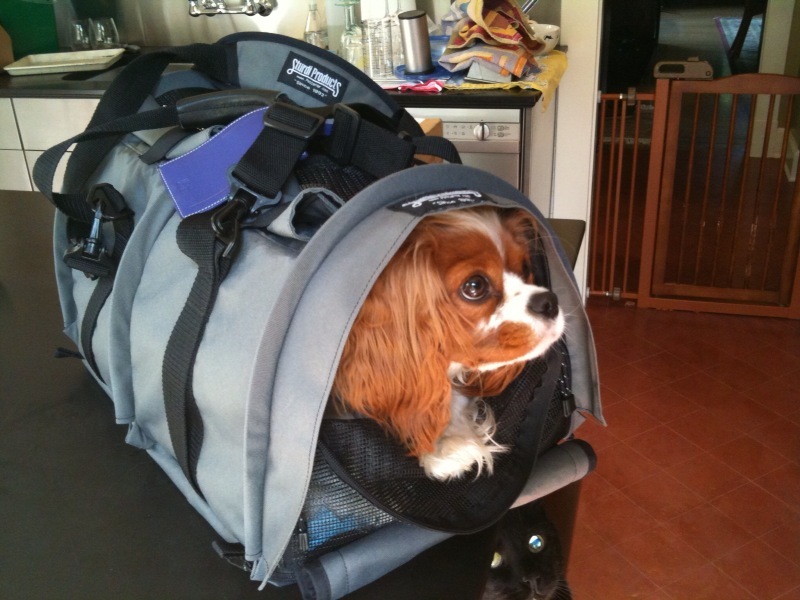 If you plan to travel frequently with your dog, however, don’t chintz on the carrier. Yes, a good carrier is expensive, but it will be sturdy and have features that contribute to your dog’s comfort and to your peace of mind. 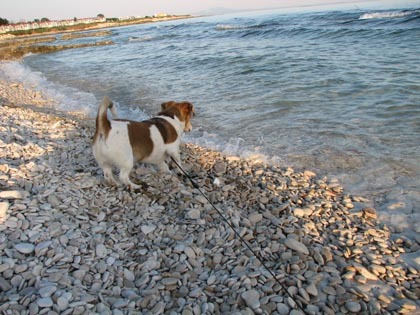 The features I look for include sturdy and big/numerous mesh ventilation panels, good-quality zippers, visual access to your dog from above (since your dog will spend most of your journey at your feet), patting access to your dog from above, at least one good-sized pocket, and minimal weight. A bonus feature is the ability to slip the bag over the extended handle of my own suitcase. The features that airlines require include mesh ventilation panels on at least two sides, water-repellant fabric, padding, the ability to completely contain your dog, and sufficient room for your dog to turn around. My choices? Chloe’s go-to carrier, the one she uses for her longest trips, is her large SturdiBag. My other favorite, and the one I use when I suspect that under-seat space is going to be tricky, is her Sleepypod Air carrier. If she weighed 10 lbs. or under, I would use her Creature Leisure Pet Pilot XL carrier (it’s a heavy carrier, though, so I wouldn’t use it if I was concerned about weight maximums). Please note that none of these carriers is a Sherpa bag, which is the original (and still most popular) soft-sided pet carrier. They have many good qualities, but their tops are solid, and I insist on being able to see Chloe from above, for both her comfort and mine. The simple fact is that most pet carriers you see in use at an airport are non-complying. Only the tiniest of dogs can fit in a carrier that is 8-9 inches tall. The bag you will see most often, a classic Sherpa bag in size Medium, is 10.5 inches tall. No ticketing agent or gate agent will turn a hair over a medium Sherpa bag, and there is, in practice, a bit of leeway afforded to traveling pet owners. Don’t take it to extremes (a large Sherpa bag is too large, as is an extra-large SturdiBag), because even if you can charm your way past an agent, you still have to fit your dog in an airplane’s under-seat space. Since that space is fairly shallow, your dog’s carrier needs to fit oriented left-to-right. A carrier that is 18 inches long works; 19 inches is iffy; 20 inches is too long. The three bags I like flex in important ways. The SturdiBag’s top and sides flex considerably, but its length is fixed at 18 inches. The Sleepypod Air can lose about an inch in height, but it is designed to (temporarily) lose up to 6 inches in length. The Creature Leisure Pet Pilot XL flexes in a different way: Zipped up, it just fits under most airplane seats, but as soon as you take off, you can pull it out from under the seat and unzip a large gusset that gives your dog a good deal of travel room during flight. That last point is an important one to remember. Your dog needs to fit under the seat in front of you for takeoff and landing, but during the rest of the flight you can pull his carrier out into the space under your knees. With that room, the top of the SturdiBag pops back out, the ends of the Sleepypod Air flip back down, and your dog has the maximum scope his carrier allows him. Black bags look smaller. If you are the owner of a dog small enough to fit in a fully-complying carrier, buy one that’s neon orange. Live it up! The rest of us need to minimize the visual impact of our pet’s carrier. If you are traveling far enough that you have a layover, you’ll want to make it a long one, so that you and your dog have the chance to exit the airport, find the pet relief area, and return through security. Some pet relief areas are conveniently located and easy to find, but many are not — and sometimes the gate you arrive at is a remote one. You’ll need to hurry to achieve your goals, and wheels help. Chloe’s a small dog, but by the time I get to the pet relief area in Denver she effectively weighs about 57 lbs. Only one of my favorite carriers (the Pet Pilot XL) has wheels, and it’s really too small for Chloe. Wheeled carriers that comfortably fit a dog Chloe’s size are typically too big to work as in-cabin carriers, unfortunately, but owners of dogs under 10 lbs. should give wheels serious consideration. Thank you Mary-Alice for your wonderful and informative post! Please be sure to check out Dog Jaunt and Pet Carrier Reviews for more information. Thanks so much, Leila, for letting me guest post! In case you were wondering, yes, I realize that Chloe’s SturdiBag is gray, not the black I recommend. It was literally the first thing I bought for her, long ago, long before I started writing my blog, in the days of innocence (and sometimes ignorance). Now I know better. Buy black. Thanks so much for this post. The choices out there for pet carriers are just too many. And thanks for the tip on buying black. I would have chosen a more pleasing color to suit my needs but black is the better choice. I have a 20 inch dog that has never flown. I have put her in an 18 inch carrier and she seems too large. She weighs 14lbs and my husband really wants me to bring her to Mexico. I would have to sedate her. Any suggestions? I’m flying Alaskan and they require a 17 in carrier but I was going to try and chance an 18 in. I thought I would give it a trial run before hand. Next post: Check out the new issue Fido Friendly!